Book your B&B in Harbin through this guide. We have selected for you the Bed and Breakfast with low rates, cleanliness, simple furnishing, often located close to local attractions. The bed and breakfast are also considered an easy tool to know the local culture of Harbin. -to Harbin Railway Station: 3km -to Taiping International Airport: 45.9km -to Coach Station: 2.5km, Harbin Shen Nong Hotel(Huayuan Branch) is Ideally located, close to international Qiulin, Yuanda shopping center, Songlei shopping center, New World shopping center, Asia cinema and Guogeli avenue. It is facing the prosperous business center in Nangang District. Near the Railway Station. It is only 2kms away from the bank of Songhua River, Zhaolin Park and the Zhongyang Street. It is about 40-minutes driving to the Airport., Located near Harbin Railway Station. It is facing the prosperous business center in Nangang District. To the airport: 30km To Harbin Railway Station: 2km To downtown: 1km, Guo Ge Li Hotel Harbin is conveniently located on Guogeli Street, close to the church and the railway station. The hotel enjoys an ideal location and convenient transportation. To Railway Station: 3.5km; To Civil Aviation Bus Terminal: 3.5km; To Harbin Bus Ternimal: 7km To Taiping International Airport: 40km, Nanyuan Inn-Harbin Guogeli Branch is located in the business center of the City centre. It is adjacent to the famous Alexei. Hsieh Sergeyev Cathedral, and near to Bar Street in Russia River Garden and Shopping &Business Center, etc. District from Harbin Taiping International Airport:45km; District from Hongbo Square:1km; District from Harbin railway station:2km;, Longda Sunshine Hotel, Harbin belongs to Longda Group and managed by Longda Hotel Management Company. Longda Sunshine Hotel is a multi-functional modern foreign-related business hotel with restaurants, entertainment center, business center, ticket center, leisure book . 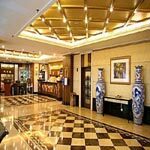 To Harbin Taiping Airport: 40km To Harbin Railway Station: 14km, Harbin Longtang Hotel is a luxury business hotel. It is located at the north shore of the beautiful Songhua River, east of Sun Island. To the airport: 45 kms; To the Harbin Railway Station: 1km; To downtown: 0.5 kms., The Longmen Hotel is located on Hongjun Street in the central Nangang district of Harbin. Hotel guest rooms are equipped with satellite televisions and air-conditioning. Railway Station Harbin Railway Station 1 km Airport Harbin Taiping Airport 37.39 km Downtown Hongbo Square 1 km Road/Landmark Zhong Yang Street 0.5 km, Ideally located at the prosperous district of Harbin, Longda Ruiji Business Hotel is 850 m from Harbin Railway Station. The hotel boasts easy access to local attractions and airport. Free Wi-Fi is provided at the hotel. All rooms here are equipped with free computer and free toiletries. Guests can rent a car to explore the surroundings and they can enjoy delicious food at Chinese restaurant and western restaurant. Besides, the hotel's host of recreational offerings ensures you have plenty to do during your stay. Opened in 2003, the 16-storey hotel houses 168 rooms and suites.